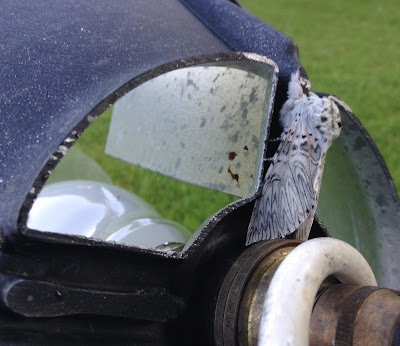 The moths paid my grandchildren a nice compliment today. 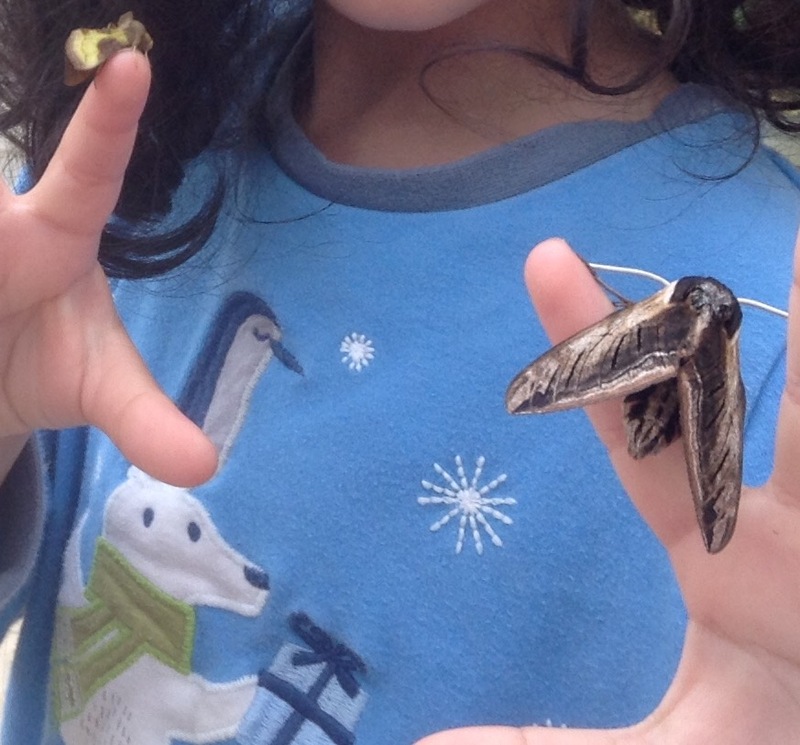 When Emily came into our bedroom with her usual request: "Can I put a moth on my finger, Grandpa? ", I was able to oblige big-time. 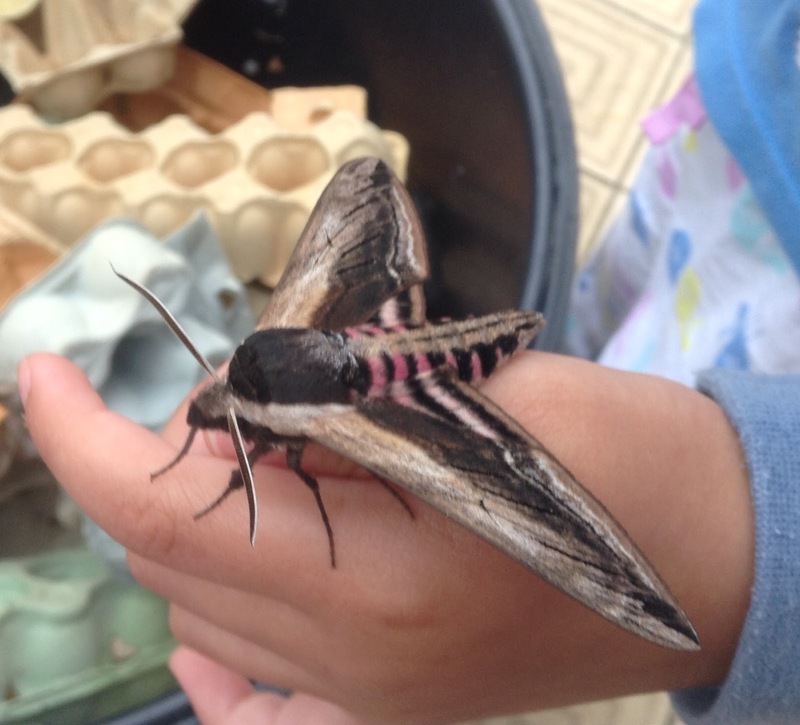 Big is the word with the Privet Hawk Moth which was slumbering in the eggboxes. 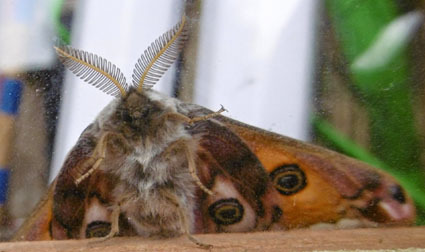 This is the biggest moth most of us are likely to see in the UK. 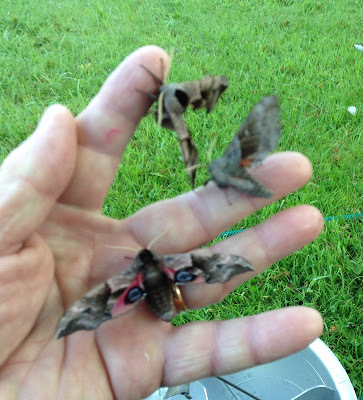 I have been lucky enough to encounter the only two which are larger: the Convolvulus Hawk at a wedding in Cornwall and the astonishing Death's Head Hawk thanks to friends in an neighbouring village who found and hatched three pupae they found their spud patch. But that was really was good luck in both cases. I hope the same happens to you, but the odds are not good. The Privet Hawk is eminently satisfactory, however. 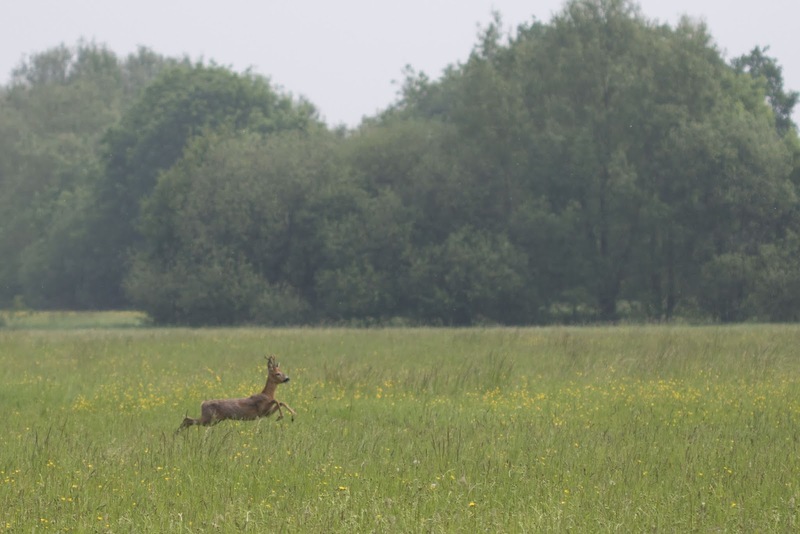 Like the deer which abound in the UK and yet remain mostly out of sight, it surprises me that such a big creature can generally pass un-noticed. Its size and scratchy legs initially caused the granddaughter some dismay. But soon she was happily providing the moth with a perch, along with her favourite White Ermines and a Burnished Brass. After a prolonged finger-moth session, we went for an expedition along the canal - and got a surprise when we hunted out the children"s lifejackets which had not been used since the end of last summer. We hope the parents will not desert but there's a limit to how far we can cope with odd nesting habits. The last one we found, a fortnight ago, was in our watering can. 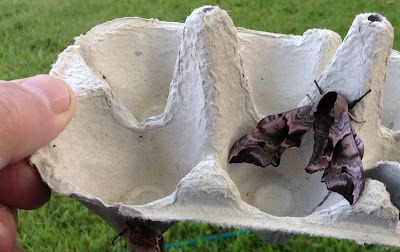 While we were out, I left the Privet Hawk in the moth trap with a towel over the opening, after alerting a family from Oxford whose school-age daughters are both enthusiastic and learned about natural history. When we got back, the trap appeared undisturbed bu the Privet Hawk was no longer inside. 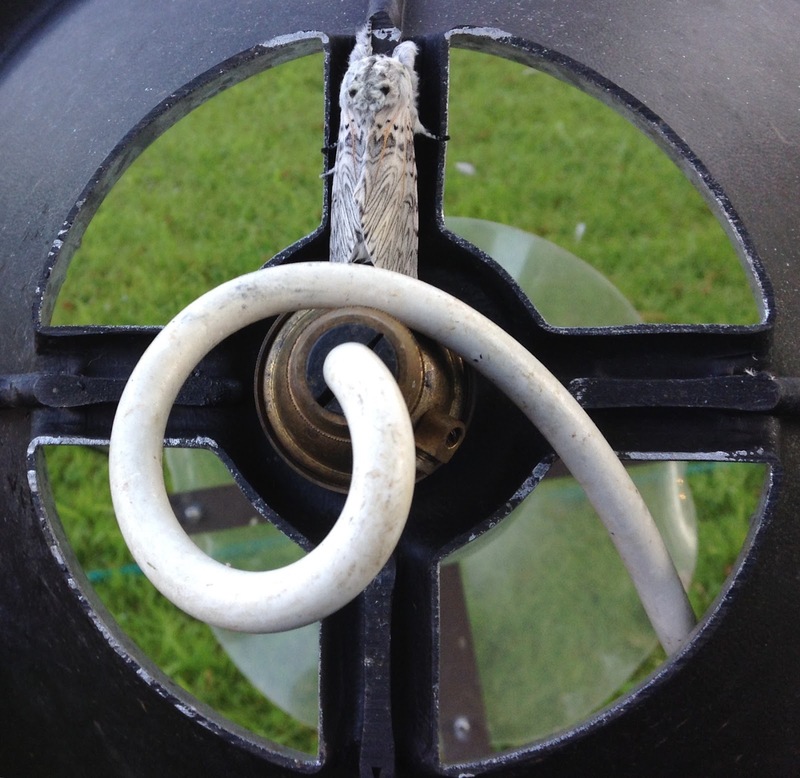 I presumed that it had been burly enough to force its way out as the towel was simply draped and not secured. We then had to go out again and I kept my fingers crossed that the girls would not come and be disappointed. they had been in the morning - while we were on the canal - and enjoyed an excellent meeting with the Privet Hawk which none of them had seen previously. 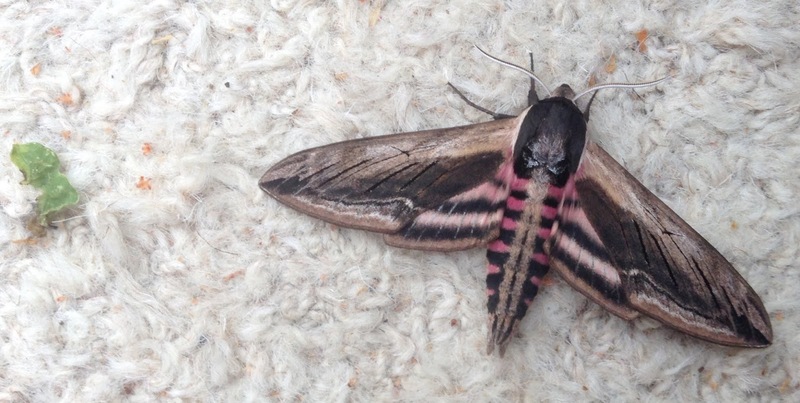 The moths were getting a bit warm, he said, and so they placed the Privet Hawk on our garden trellis nearby. And here it still is, at 7.15pm. Probably too big for a bird to tackle but also a still as a statue which is the way to evade birds' eyes. 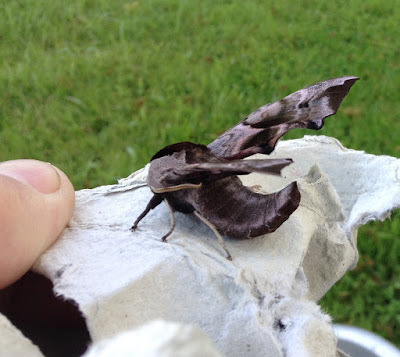 There are too many moths every night at the moment for me to keep pace, but here are my best, though incomplete, efforts regarding some of them. I conclude with another favourite, simply because of its vivid colours, the Cinnabar. Long live ragwort (its food plant), say I! 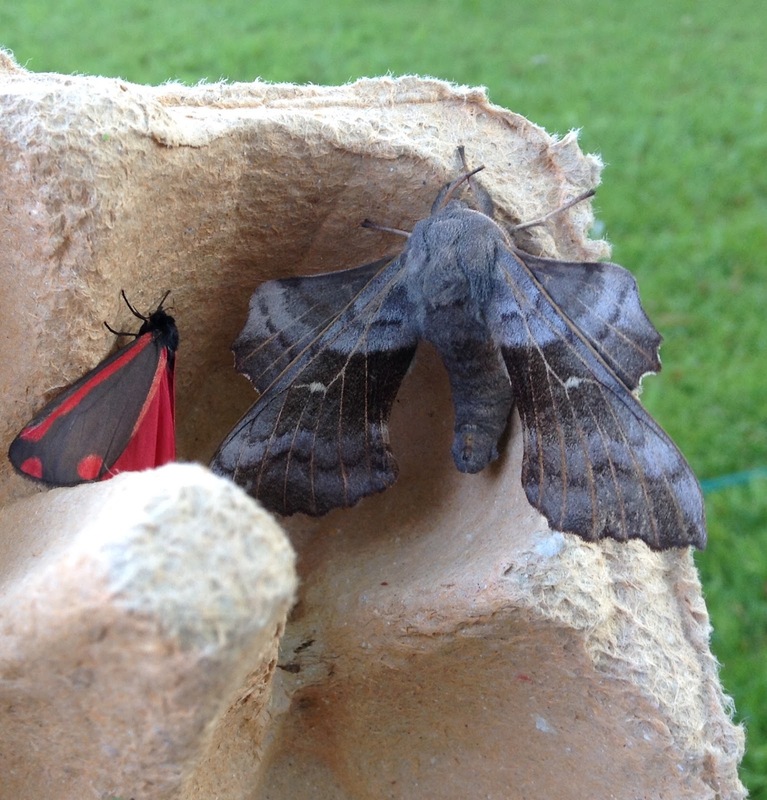 Excellent moths keep coming nightly, with the lovely warm temperatures which we are enjoying. But since the grandchildren have also arrived, my time has been severely limited and my attention wildly distracted. Above, for example, is the successful meeting of the regular morning demand: "Grandpa, can I have some moths on my fingers?" I have therefore missed a whole range of new (for the year, not completely new) arrivals, but here, above, are a couple of personal favourites which I did find time to photograph - the Burnished Brass and the twig-like Buff Tip. 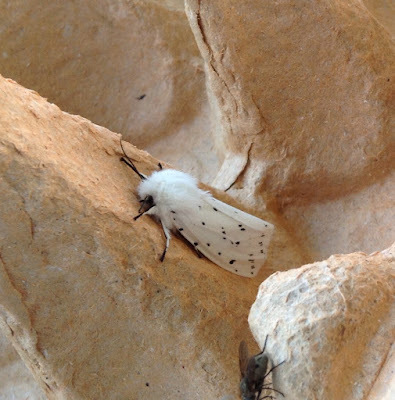 In passing, I might also mention that the trap is particularly popular with White Ermines at the moment, my granddaughter's second favourite after Elephant Hawks. This is a lovely time of year for the moth enthusiast. 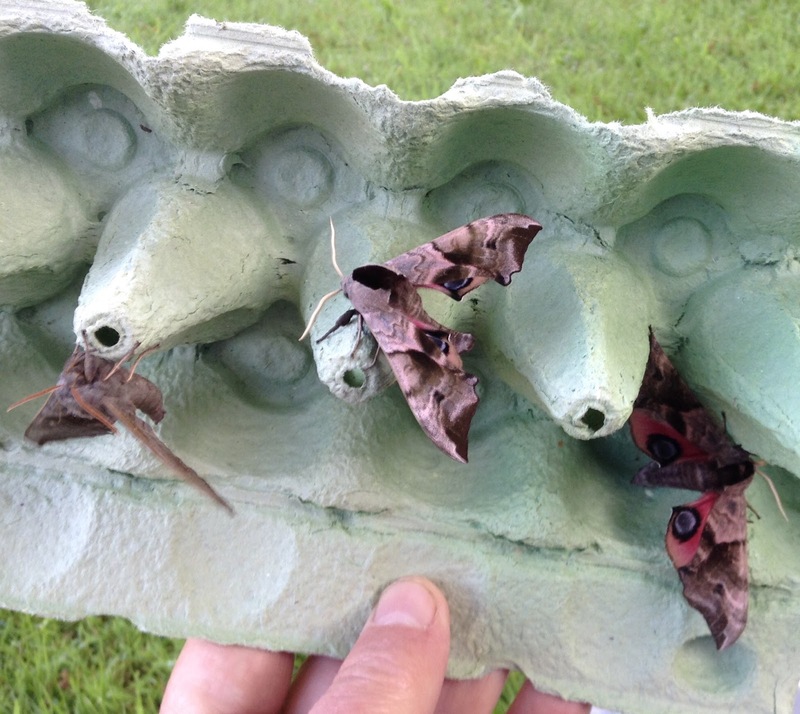 Every morning, the trap offers fresh beauty and excitement even if almost all the inhabitants of the eggboxes are species which I have seen before. The weather is less of a deterrent, too. Last night was warm but turned wet in the small hours. 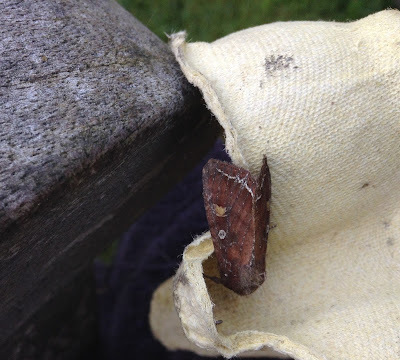 In spite of that, Mr and Mrs Robinson's rain-shield did its job perfectly and protected, among many others, my grandaughter's favourite moth. This is the Elephant Hawk shown in my first composite picture (the excellent app called Layout is how I do those0. You can see why a little girl might like it. Like so many other grandparents, parents and other carers, we have fought a losing battle against fascination with pink - although her little brother approves of it too, but perhaps mostly because he faithfully copies his sister in all that she does. But is it pink? Or is that exquisite limey-green the dominant colour? I would answer Yes to this question so far as the topwings are concerned - and not forgetting the white, black and grey as well which add powerfully to the overall effect. But underneath, pink wins hands down. The Elephant Hawk is dear to me as the first moth I bred from caterpillars, striking creatures with 'eyes' and a long grey body like an elephant's trunk; hence the name. As I have recounted many times, my kind mentor John Armitage, natural history curator at Leeds City Museum when I was boy, told my brother an myself to look for the catties in August on the lower leaves of rosebay willowherb growing on the verges of Leeds ring road in Adel. We looked and there they were. A useful tip he gave was to wait until late in the season when the mature caterpillar goes grey after spending its previous instars being green which makes it much harder to find, like runner beans. I didn't think that I would find myself breeding Emperor moths again, after all the angst and turmoil of raising three previous broods on willow which dried-up and curled with annoying speed. But I couldn't resist the progeny of the Emperor which escorted Penny and myself to Windsor (for a boat trip, not the wedding), and I have been rewarded by their loyalty to hawthorn which lasts fresh longer. 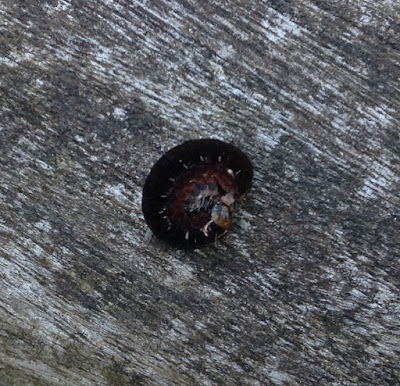 They have been sharing their Tupperware home with the much larger and very fast-moving caterpillar in my second and third pictures (and featured in the previous post). But not any more. 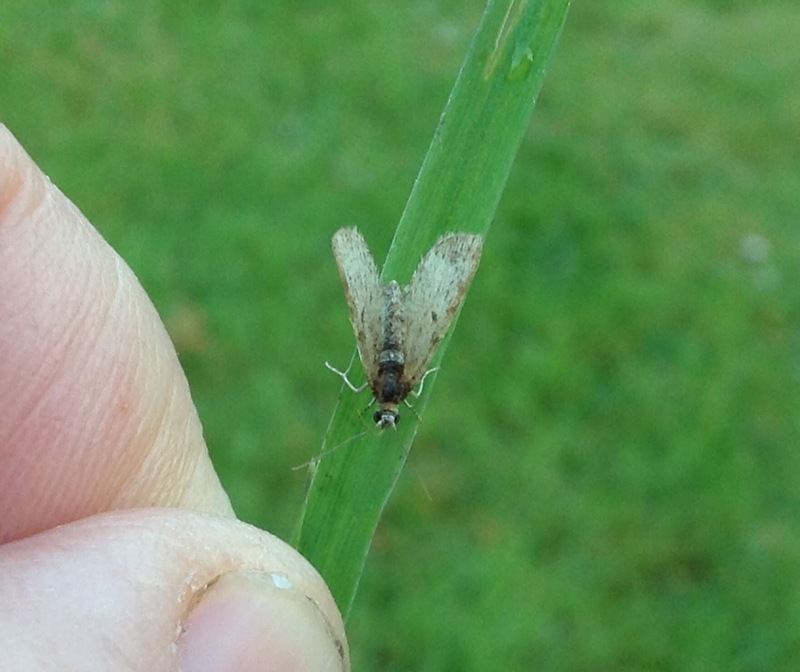 I appealed for an ID from the unfailingly helpful Upper Thames Moths blog. One of their friendly experts, Marc Botham, suggested that it looked like a Satellite moth cattie - a species known to eat other larvae. 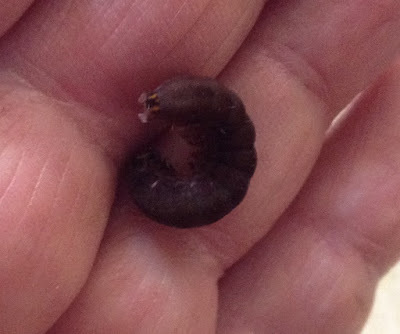 I have hastily released it on to a hawthorn bush, leaving behind only its poos, whose difference in size from the Emperorlets' show the difference, as pictured below. 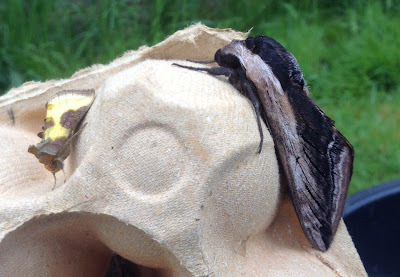 The moths have a fine record of being good to me on my birthday, so I wasn't concerned when yesterday morning's haul was modest. The birthday had many hours to go, I reasoned, at least three of them in darkness. When we got home from assorted treats laid on by Penny, my hopes rose higher still: the late evening was full of scent from Spring blossom and the air was reasonably warm. 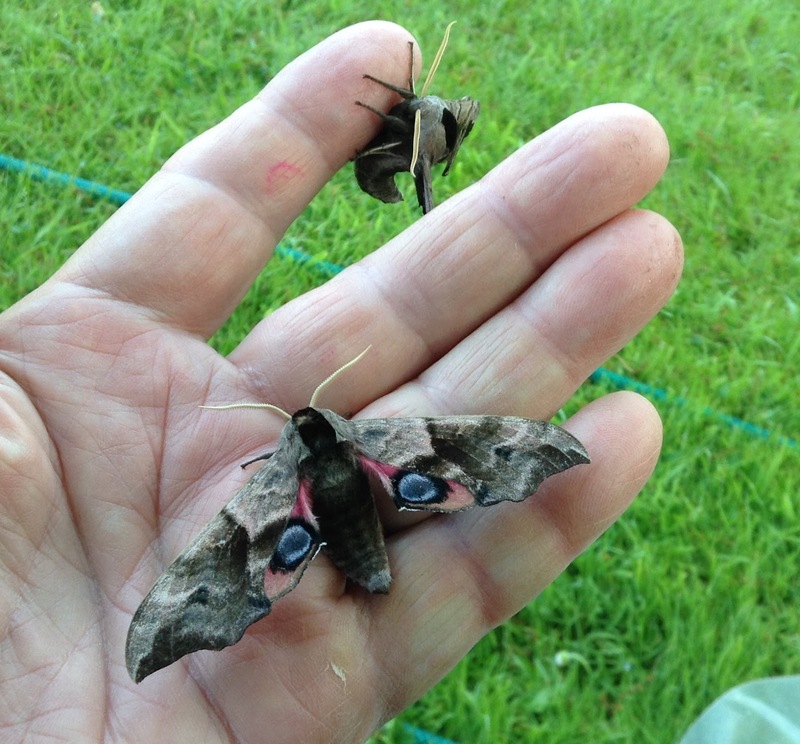 Sure enough, this morning produced these beautiful visitors: two Eyed Hawks, a Poplar Hawk and a Puss Moth neatly positioned on one of the cross-bars of the trap's bulbholder. 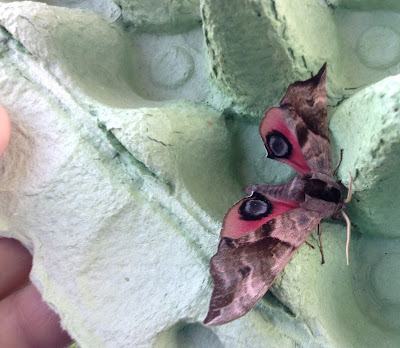 The moths were extremely sleepy and I had no trouble persuading them on to my fingers for a bit of fashion photography. They are now back in the eggboxes and will, I hope, stay sleepy long enough to be enjoyed by a family on a sponsored walk up the canal who are calling here for breakfast at 9am. 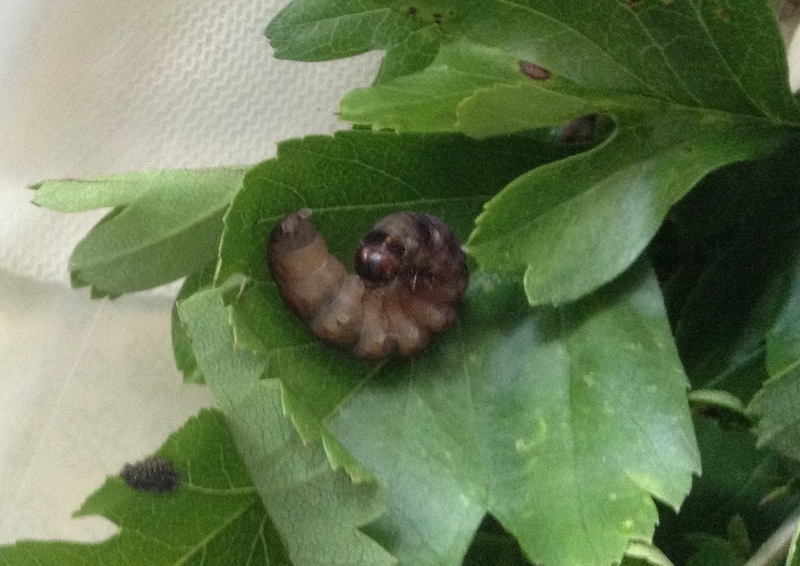 Things are lively here in another respect: my Emperor Moth eggs have hatched and we now have another nursery of aristocratic caterpillars. I am hoping that this time round, things will be less hectic as I am feeding them on hawthorn which lasts a little bit longer than the slender willow leaves on which I raised previous broods. 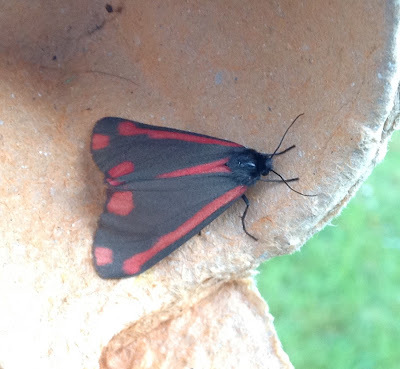 Also in the trap: the Cinnabar shown above with the Poplar Hawk, a couple of pretty White Ermines, a Powdered Quaker, a Bright-line Brown-eye, a lovely with its subtle hint of violet - and another, so far unidentified cattie which is sharing the hawthorn with the Emperorlets. 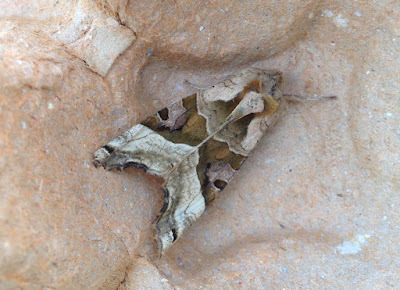 The trap has been modestly populated since I last posted, perhaps because of temperatures falling quite sharply at night after the lovely warm days which we are enjoying. 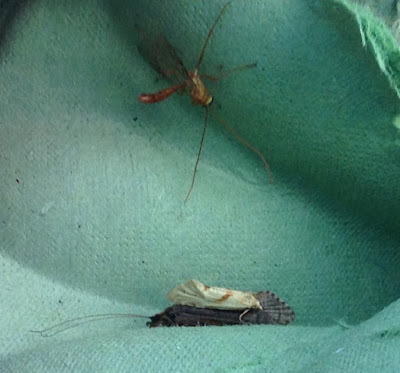 Nonetheless, there has been variety among the arrivals with a little colour in contrast to the demure grey Muslin moths which form the majority of guests. 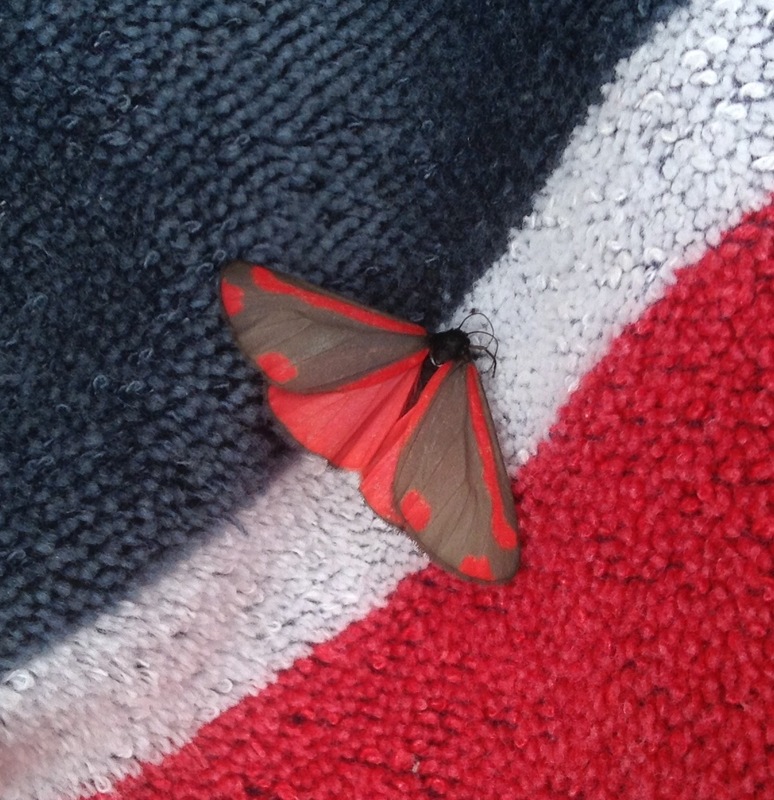 The Brimstone and Cinnabars shown above were specially welcome in that regard. 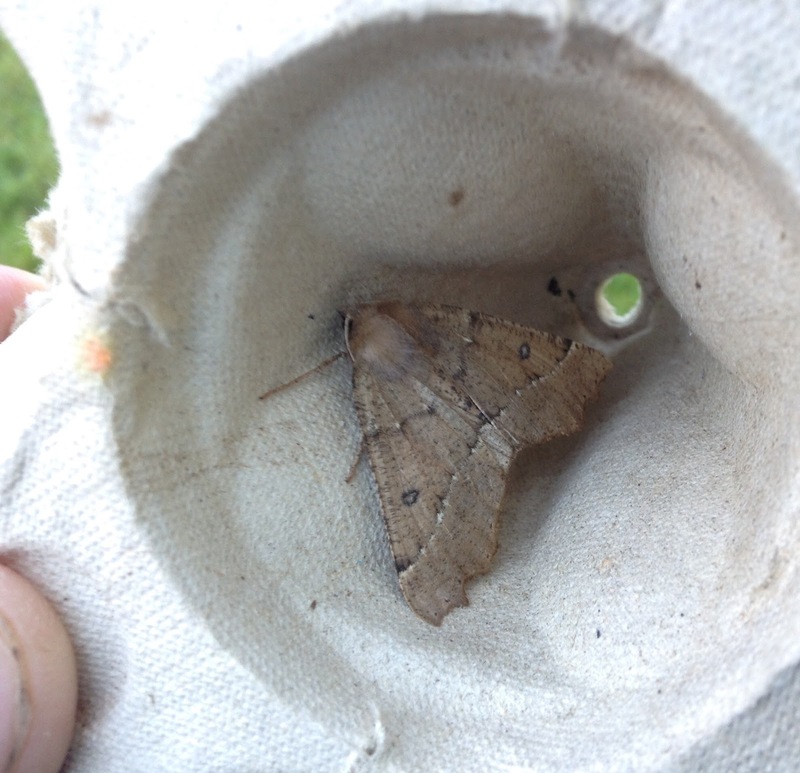 More in keeping with the Muslins was my third moth pictured, a Scalloped Hazel. Its low-key colouring is made up for by the unusual, serrated shape of its wings. And as with so many superficially drab moths, its patterning is delicate and subtle on close inspection. The next moth led me a merry dance and my iPad Mini - my only means of photography at the moment - had problems getting it into focus. But technology triumphed in the end and the moth - initially trapped upside-down on the dewy rim of the trap which may have accounted for its friskiness when freed - finally settled down enough for me to decide that it is an Ochreous Pug. Finally, people examining my catches often ask about the difference between a moth and a caddis fly and the pair below conveniently provide a study in contrast. The micro-moth which I think is Agapeta hamana has found a comfy perch on a caddis, whose extra-long antennae are the distinction I use to separate the one tribe from the other. "It's a prawn!" said Penny, when I took her this moth as part of our wedding anniversary celebrations (goodness, is it really Ruby next year? Yes). She was accurate in her description. Although the colour and pattern of the Pine Beauty are delightful, they and the resting position are definitely prawn-like. 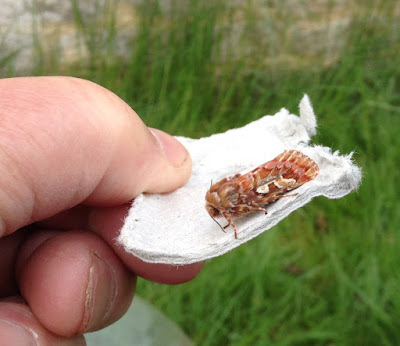 Mind you, I love prawns, so the description is entirely in the moth's favour. 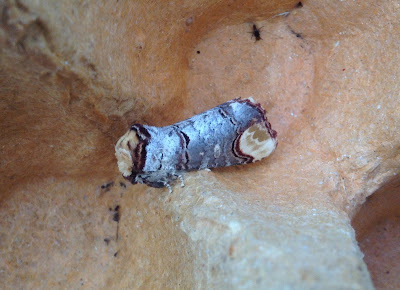 I had to wait for our move from Yorkshire to Oxfordshire to see this moth in my own trap, although they are widespread in the North of England and Scotland and I came across one when making a radio programme about moths in pine-rich Forestry Commission woodland beneath the Whietstonecliff escarpment in North Yorkshire. 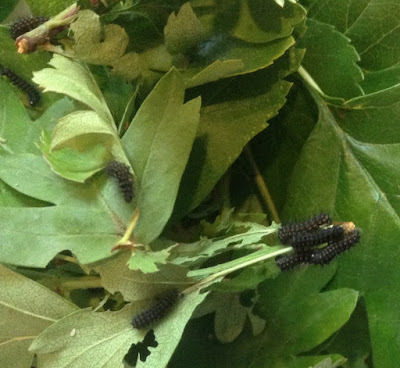 Pine enthusiasts are ambivalent about the insect, however pretty, as its caterpillars have a healthy appetite. But with the exception of major pest damage when a tree called the North American Lodgepole Pine was introduced on poor soils in Scotland, it has been pretty well-behaved. 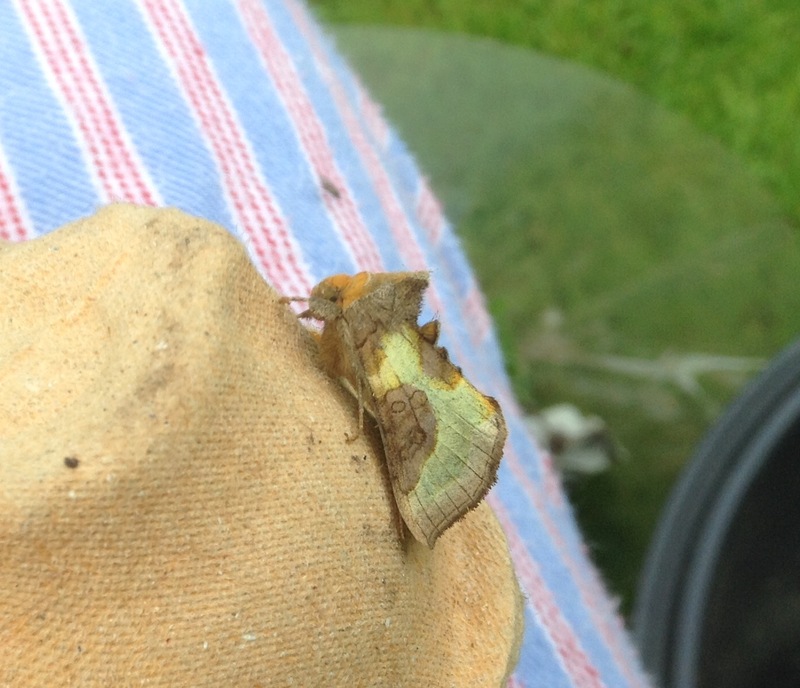 My second moth today has also led me a geographical dance. I first saw the Small Dusty Wave for definite on a wall in Bloomsbury, London. 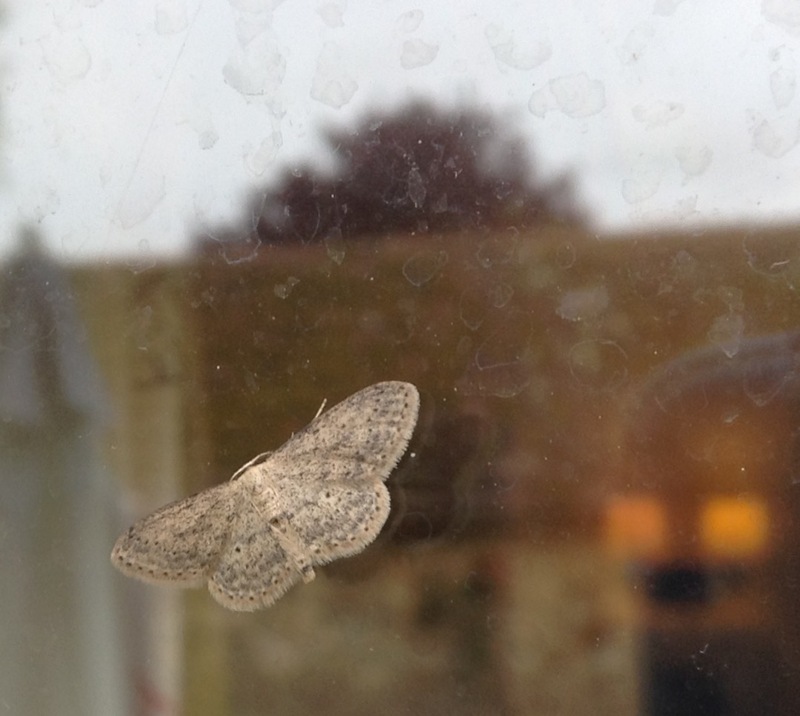 Yesterday morning, I found one slumbering on one of our windows here. 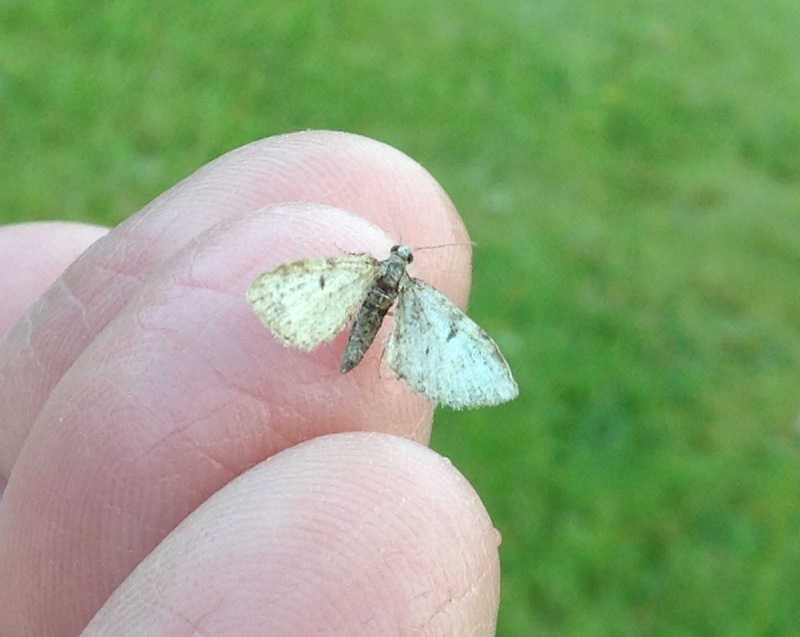 It is tiny and often mistaken for a pug moth initially, an assumption which I made. But it has a lovely, gentle appearance which deserves the word 'dusty'. I hope that it feels at home here and starts a family. 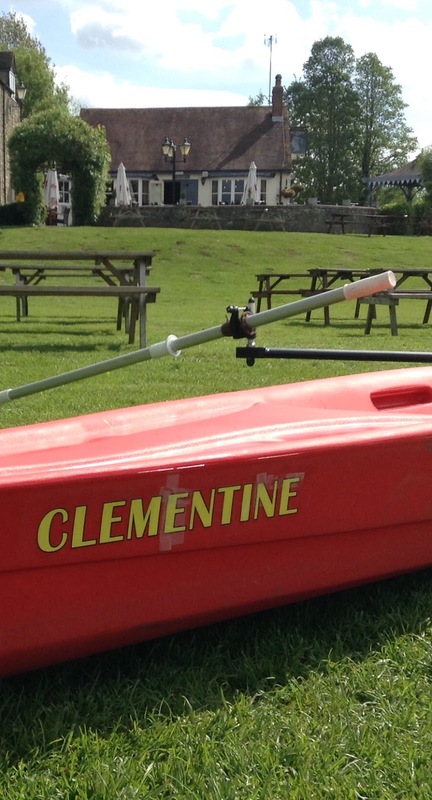 This morning's moths brought a welcome change in the colour spectrum which chimes nicely with the livery of my sculling boat, Clementine, which is due to carry me down the Thames to London in September. 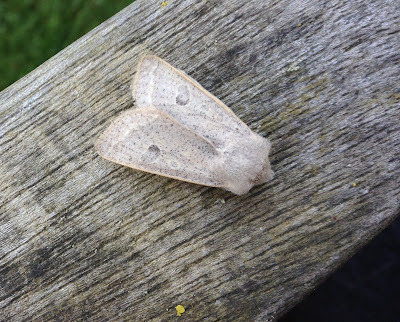 The Orange Footman is one of the UK's many moth-y success stories, a suspected immigrants species (sorry for any chilling echoes of current Home Office language) which has expanded from its south-western landfall as far north as Yorkshire. 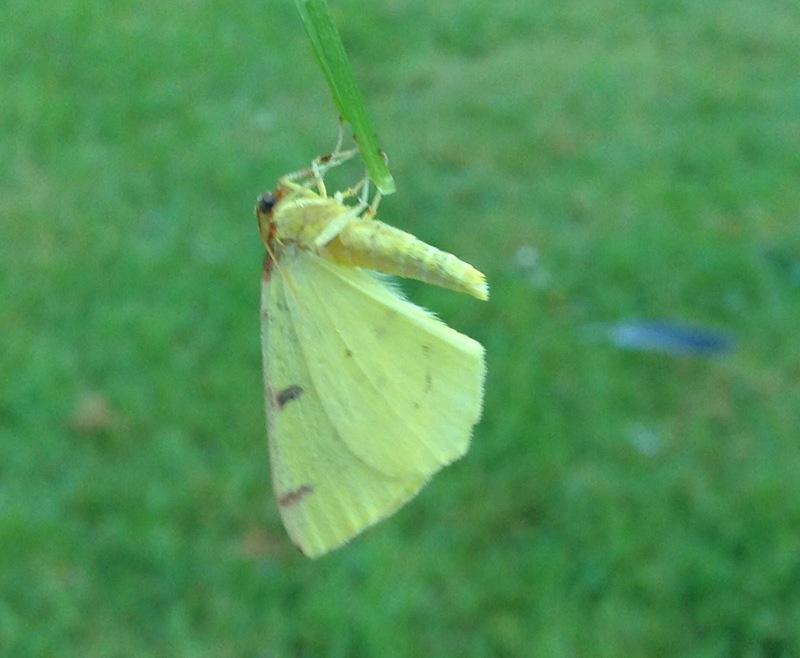 The Brimstone is an old and common favourite, a lovely moth whose equally delightful butterfly namesakes are numerous and active in the current sunny spell. I hope that you have them too, with their pretty companions, Orange-tips. 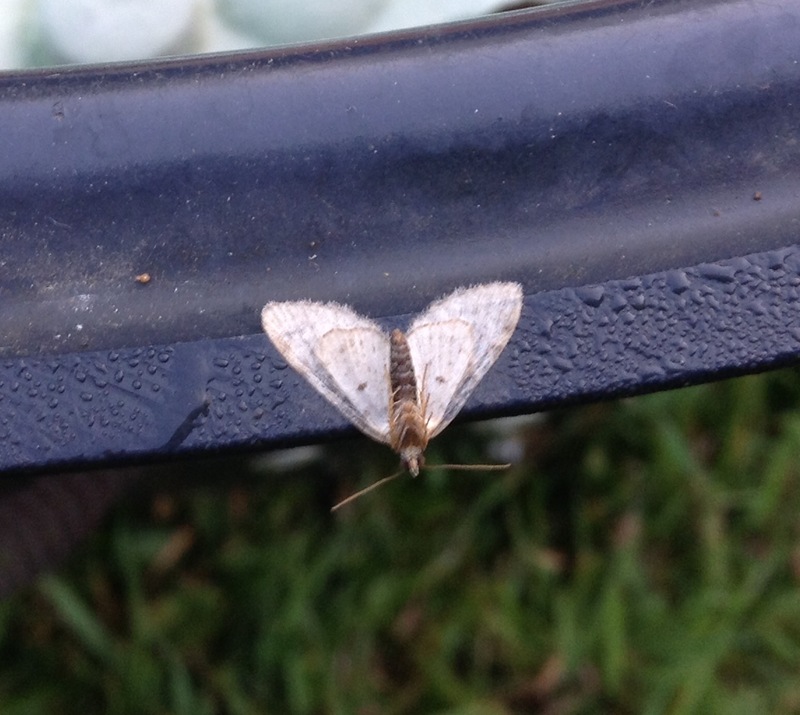 Pugs always have me foxed and I have applied for help with today's, as usual, to the unfailingly helpful Upper Thames Moths blog. My guess is Brindled.